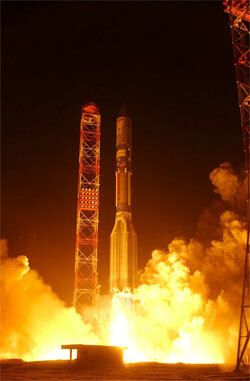 The final space launch of 2005 powered off the pad Wednesday night when a Russian Proton M rocket departed Baikonur Cosmodrome carrying an American satellite built to relay broadband communications to specially equipped jetliners flying across the Pacific Ocean. The mission began at 0228 GMT (9:28 p.m. EST) with the roar of the heavy-lift Proton's six main engines propelling the 200-foot rocket into the predawn skies of Kazakhstan. The launch had been delayed from December 5 because of a problem detected in the vehicle's control system, forcing the rocket to be returned to its processing facility for replacement of a faulty gyroscope. Wednesday's countdown hit the target launch time as planned. Less than 10 minutes into the flight, the three stages that made up the Proton "core vehicle" had completed their systematic firings and dropped away, leaving the Breeze M and attached AMERICOM 23 spacecraft on a suborbital trajectory. The upper stage then performed its first firing into a low-altitude parking orbit roughly 108 miles high as the vehicle flew off the eastern-most stretches of Asia. After orbiting for about 40 minutes over the Pacific and South America, the stage re-ignited for a 16.5-minute burn to begin raising the orbit's high point to geostationary altitude of 22,300 miles. This firing above the Atlantic and Africa resulted in an intermediate orbit of 160 x 3,100 miles. Another coast period took the rocket around the world, setting up for the Breeze M's third burn over South America three-and-half hours after liftoff. The motor featured an additional propellant tank, which was emptied during the 11-minute firing and subsequently jettisoned following the stage's third burn. With the tank separated, the stage immediately fired again for a six-minute burn while crossing the Atlantic to climb into a 245 x 22,260 mile transfer orbit. The stage and cargo then settled into a five-hour coast through space to reach a position over the Indian Ocean for the fifth and last Breeze M burn that headed for a 4,000 x 22,240 mile deployment orbit. The seven-minute maneuver was completed almost nine hours into the launch. At about T+9 hours and 19 minutes, the 11,000-pound AMERICOM 23 spacecraft was released from the rocket to complete the seventh Proton mission of the year -- the second since Sunday -- and the venerable vehicle's 318th flight in four decades. It was the fourth commercial Proton flight performed in 2005 under the control of International Launch Services -- the firm set up to market Proton and American Atlas rockets. ILS has now flown 35 Proton missions over the past 10 years. AMERICOM 23 will use an onboard kick engine to ascend into geostationary orbit where the spacecraft will park itself at 172 degrees East longitude along the equator. That vantage point will enable the satellite to beam signals northward to Alaska, southward to Australia and New Zealand and anywhere across the Pacific between California and Bangladesh. Princeton, New Jersey-based SES AMERICOM will operate the Spacebus 4000 satellite during its 16-year design life. The craft was built in Toulouse and Cannes, France by Alcatel Alenia Space -- the new European firm created by the joining of Alcatel Space and Alenia Spazio. The Ku-band communications payload of 20 high-powered transponders will serve long-haul airline routes over the Pacific to provide broadband connectivity for the Connexion by Boeing system. Passengers can use their laptops to check email and access the Internet with high-speed links. 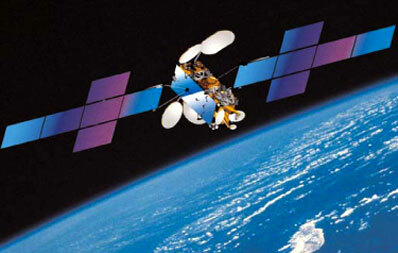 The 18-transponder C-band package on the satellite will focus on the ground for more conventional telecommunications services of television and cable broadcasters, Internet providers, government and educational customers, and networking links between North America and the Pacific Rim. "We compliment the Alcatel Alenia Space team for delivering this very sophisticated satellite, which we designed to address a spectrum of customer applications for the next decade and beyond," Ed Horowitz, president and CEO of SES AMERICOM, said recently. "We have customers on both sides of the Pacific waiting to use both payloads in early 2006." The rocket launching AMERICOM 23 is the modernized Proton vehicle built by Khrunichev. Russian officials say the Proton M is friendlier to the environment since its optimized engines leave less unused fuel in the booster. Any residual propellant is then vented in the atmosphere before the vehicle stages impact in Kazakhstan, reducing contamination in the landing area. The rocket also sports upgraded digital control avionics that improves the accuracy of the launch. The Breeze M stage, also made by Khrunichev, was designed to be relatively compact in size to free up more space in the rocket's nose cone for the payload. It was derived from the Breeze stage flown on the smaller Rockot vehicle. The Proton M/Breeze M can haul heavier payloads into orbit than the older Proton K and Block DM upper stage combination. Wednesday's launch signaled the final rocket liftoff in 2005 -- a year that saw 52 flights reach orbit, plus three failures, from spaceports around the world.